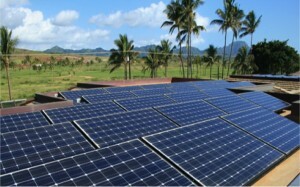 Hawai'i Green Growth aims for 70 percent clean energy (40 percent from renewables & 30 percent from efficiency) by 2030. Photo Courtesy of John DeFries. Affordable energy is vital for a community to thrive, and the proposed merger of NextEra Energy Inc. and Hawaiian Electric Industries Inc. is on everyone’s mind in Hawai’i. Kris Mayes, founding faculty director of the Program on Law and Sustainability at ASU’s Sandra Day O’Connor College of Law, is providing support to the County of Hawai'i in research and analysis related to the proposed acquisition. Filings have been submitted with the Hawai'i Public Utilities Commission, where NextEra has agreed to accelerate the state’s goal of getting all of its power from renewable resources. Mayes was the chair of the Arizona Corporation Commission (equivalent to the Hawai'i Public Utilities Commission) from 2003-2010. She and Senior Sustainability Scholar Paul Hirt will deliver classes as part of UH-Hilo’s new energy certificate in summer 2016. The 15-credit interdisciplinary certificate examines the current affairs of energy and sustainability, including: how energy affects peoples’ lives, energy policy options, the science of energy and energy generation for today’s society. More information can be found here.